Caption LaborFest was established in 1994 to institutionalize the history and culture of working people in an annual labor cultural film and arts festival. It begins every July 5th which is the anniversary of the 1934 “Bloody Thursday” event. On that day two maritime workers Howard Sperry member of the ILA and George Coundourakis of the Marine Cooks and Stewards were killed by the police attack on strikers and their supporters. This touched off a general strike and led to the complete shutdown of the city. This was one of the most important general strikes in the history of the United States and led to hundreds of thousands of workers joining the trade union movement. 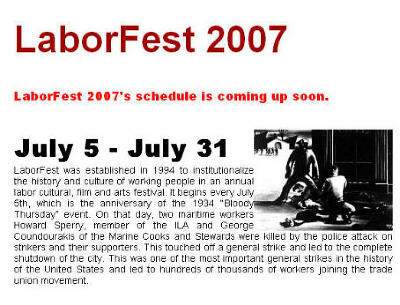 Headline JUL: LaborFest - history & culture of the working people.